An interview with Greenpeace Canada about testing supporter engagement to improve street canvassing results. As traditional models get upended and a generation of supporters and donors get older, global organisations are being forced to develop new, innovative ways to reach new audiences. For decades, Greenpeace street teams have been tasked with paper, pens, and a mandate to raise money for crucial initiatives. As the public has become attuned to the clipboard-laden activist on the street and new technologies often limit face-to-face interaction, an alternative solution might be on the horizon. 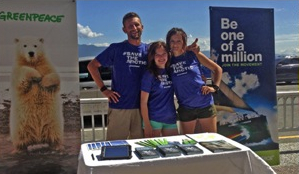 Greenpeace Canada street team members meet new supporters. 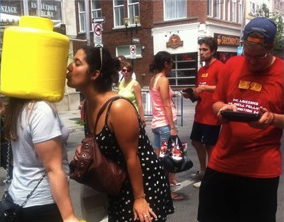 Over the past month, Greenpeace Canada teams went out to the streets with the mandate to engage new audiences. Rather than getting donation commitments, the leadership asked the teams to change the approach to find people willing to take that first step with the organisation, to build a diverse environmental movement, and to identify burgeoning activists, donors and volunteers. 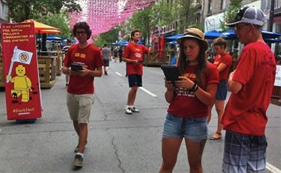 Fundraising Director Toby Bourke made the decision back in May 2014 to transition Greenpeace Canada’s former street fundraising program to a new digital street team initiative, First Engagement. Bourke had noted the success of a face-to-face engagement pilot project at Greenpeace Belgium, and also the ongoing success of the engagement component of Greenpeace New Zealand’s direct dialogue program. Greenpeace Canada volunteer and fundraising teams previously worked together on and off for the past year on a program called “VolCans” (Volunteers-Canvassers) in which a canvasser would lead a team of volunteers in gathering petitions at events. Organisers had also tested decades of petition-gathering initiatives with direct dialogue teams using paper forms. 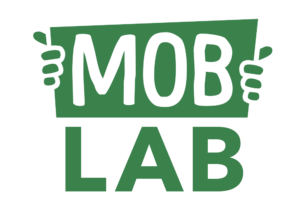 Mobilisation Lab chatted with Toby about this new approach and its implications for supporter-centric engagement and future fundraising efforts. 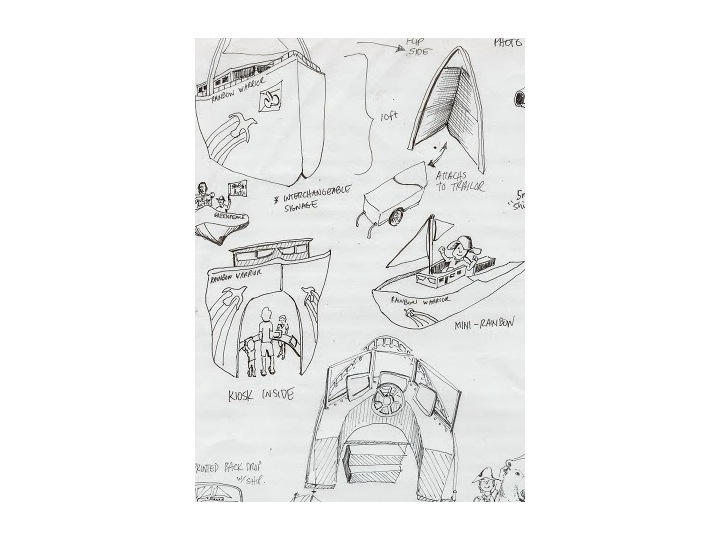 Mobilisation Lab: What sparked the idea to try out this new approach? Toby Bourke: The move to make us more of a supporter-centric vs donor centric. We’ve embraced engagement. We needed to offer the public every opportunity to identify themselves to us. Previously, you either gave us money or went away. The public usually avoided us on the street. This process works to change that narrative. The challenge is to give people an opportunity to say they support our work, even if it’s a statement of intent rather than an immediate commitment. ML: Why would a fundraising director be so concerned with broader supporter engagement? TB: We tested it in other places, including Belgium. The ROI was very clear as street fundraising, but in addition, we have names/details for 1000’s more supporters. Why wouldn’t we do that? Our goal is to try to get each canvasser to provide us with sufficient data per day to get 3 subsequent telemarketing conversions to monthly giving. This equates to about 70 new sign ups per day, with at least 70% valid telephone numbers. If we do this we can actually deliver great ROI plus we know that people we convert over the phone will subsequently upgrade their monthly gift in higher numbers because we have their telephone data and we know they answer the phone. This is about future engagement, not just immediate fundraising. In Canada, we are building these walk-in “Arctic Sunrise” booths. People will want to come to us. The concept is very cool. ML: How does this more holistic approach, which seems to engage people more fully in overall campaigns rather than simply asking them to be donors exclusively, ultimately help fundraising as well as the organisation overall? Tablets help gather supporter data and provide real-time monitoring of results. TB: Well, I think it helps fundraising and mobilisation. It is the moment in which the public says “I might be a natural constituent of yours.” We create a holistic supporter journey. Fundraising is part of it but we want to be a people-powered organisation. We get the data to our marketing partners as fast as possible to follow up with an ask. Telephone conversion rates for monthly giving are currently running at over 10%. ML: What elements of this program do you think are different from the canvasser programs in the past? Do you think these differences are contributing to the initial success you’re seeing? TB: These new teams don’t ask for money at all. We want the public to feel uninhibited to interact in that arena. That way, the first impression of Greenpeace isn’t about money. They feel like they’ve done something that will change the world. Street fundraising has high attrition rate because largely young fundraisers self-select young donors. This gives us an opportunity to pick who we want as supporters…and then they might become donors after. We can look through data and see who won’t be suitable donors, but might be new street team members, and approach them differently. ML: In developing this program, what were your goals? What would be considered success? TB: The overall goal was 1M new supporters by end of 2015 (including offline and online). First Engagement will contribute at least 40% of that. This is a good space for us to be in because we are good at online. We’ve become addicted to online and don’t do the offline, in-person engagement, as well anymore. There is very powerful potential. ML: What were people responsive to on the street? Were people aware of Greenpeace? TB: People were still wary of us because of the fundraising history. The more audio/visual we become, the better that will be. The first month, we signed up 20k people, so we are making that case quickly. Here in Canada, we have very strong brand recognition for good and bad reasons. The backdrop of environmental politics is polarized here. Many people identify themselves as either a supporter or an opponent. ML: If one of the goals was to reach new audiences, what was your approach (new geographic areas, look at market research areas to define new targets, etc.) and do you think you were successful in reaching these new audiences? TB: We were setting up in different places. We set up around student concentrations at first, but that was too obvious. So we went to the busiest places, by busy metro stations, during morning and evening commutes. It is important to be mobile, so audio/visual set-ups can be moved quickly. Some areas worked better during lunch and others during rush hour, so we adjusted accordingly. ML: What are some of the initial results you’re seeing? What performance metrics are you looking at to define success? TB: As I mentioned, 20k new names in Vancouver and Montreal alone. We have only 16 people on the street teams. 70% of the new names have telephone numbers. We’re contacting half within 48 hours. That has been converting at 10% for fundraising. 1.8 donor sign ups per first-engagement. And this is just the first month. This is a major improvement from street fundraising, almost 3-4x as much. I expect that to hit 3 donors per engagement soon. Monthly giving is a new things so we are also hoping that will increase, as well. And with phone numbers, we can always approach later with upgrading and new engagement requests. ML: Can you highlight some key points in terms of technology used, data captured, and digital automation, and how that has supported an efficient process when it comes to on-boarding new supporters? TB: These new displays can collapse down to the back of a car or a bike trailer, so they are very mobile. At the moment, they are literally conference displays. They will evolve into audio/visual displays, which are more interactive. Kids can play with things, include video screens. People have also dressed as legos, sharks, tigers, which attracts kids, and thus parents. For data, we developed our own interface, using Geckoboard, on an iPad that collects all data and sends back to HQ in real time. Monitoring it during the day is very important. If we see no data coming in from one team, either something happened, or they need to move to a new location. It isn’t just petition-led and fundraising-led, so its also just getting data on the issues that are important to supporters. Not just against, but what they are passionate about. This can be used for future campaign engagement. ML: Are you taking steps to continually improve/optimize the data program where you can? TB: Yes, we’re looking for a great data analyst now and want to do more. We have proved the concept and now need to get into the data manipulation and make that work to our advantage. ML: How does this story on the street continue throughout the on-boarding process and through additional engagement touchpoints? TB: We know if they came on through Lego, oceans, etc. Follow-up calls definitely continue that messaging. It is very important to do that so the supporter remains engaged in the conversation and feels part of the movement. ML: What advice would you give to other offices or organisations who want to try this approach? TB: Test it. It would be great to see a larger Greenpeace office try this. It isn’t a huge investment and you can quickly see the data. We can create an international matrix of what our expectations are. Greenpeace France is just starting this, and I know New Zealand has done it in the past with success. When I go back to Greanpeace International, I’ll definitely be looking to a major office to see if it can work elsewhere. ML: What’s next in the 2.0 version? TB: The next iteration is for people to interact with billboards in public. An interactive stand that can be put up in public. We want our engagers to take the tools to public places and help create an environment that allows people to interact with those tools. The UK did WrongMove.co.uk, which asks you to type in your post code and would tell you if you were getting fracked. Soemthing like this could be in a next versions so we we are collecting data and giving info back to supporters in real time. The more supporters are getting something immediately back from the experience on the street, the more engaged they will be in the future.